Another category of quick-fix salads that can be prepared without even entering the kitchen! Just pick out the required ingredients, toss them together in a bowl, and place them on the table with the meal. Easy though they are to make, the tongue-tickling flavours and enticing aromas of these salads are sure to delight you. 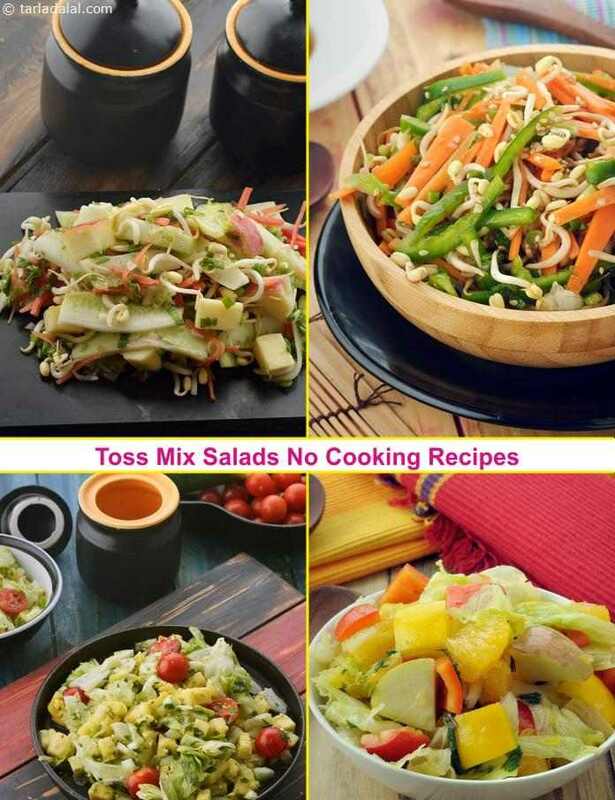 Try out recipes like the Bean Sprouts and Suva Tossed Salad or Watermelon and Mint Salad to believe our claim. A light and colourful way to begin lunch! Suva, tomatoes and bean sprouts combine beautifully with salt and lemon juice in this tangy, crunchy Bean Sprouts and Suva Tossed Salad. Suva is an excellent source of iron, while bean sprouts and tomatoes are rich sources of vitamin C which helps to absorb Iron.